ksyardbird - Robin Zs musings, mutterings, and creative muddle: Monday's Forecast is Good! Hope you had a good trip through the weekend! I, untypically, turned into a tube-aholic and though I was motivated, felt like I was moving in slow motion. Didn't get very far on anything. But honestly? It was good! Got caught up on cheesy made-for-TV-shows (last ones I'd watched were Christmas-themed) and did a lot of thinking. Well, that's not quite fair. . . I did begin the piecing process on my first quilt block. Got it all done but the checked strip. Had to rethink my initial plan. Thinking is doing something, right? Even if it is done on the couch in front of a cheesy made-for-TV movie. After all that thinking I had a plan - and I think it worked out marvelously, BTW! Minimum checked fabric will go to waste because of my first measuring mistake and then change of design. HOORAY! I also now have all 17 of the center squares cut, all 34 of the short checked strips, and all 34 of the long checked strips. Working on the full-sized blocks in the patterned fabric - I need 18 and I have 10 cut. It's at this stage of the project, at least for me, that I begin to wonder what the heck am I thinking?? The long process to the end goal starts kicking in. . . but, truly, the hardest part is nearly over - preparing to make it. All that thinking can really drag a person down. . . . ha! It took some time to figure out the best way to piece this block as the focal fabric is a unique shape. In the end, I'm going to attach the surrounding pieces (the brown and the cream) to the patterned octagon, then stitch them to each other. It will involve a bit of clipping at times to keep those corners looking nice - but actually isn't as labor intensive as I thought it would be. Esp. as I only have a total of 17 to do. So guess what my goal is this week? Yeah. . . 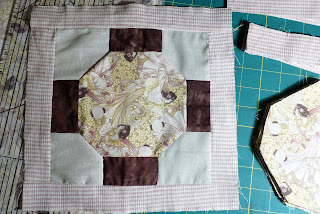 I'd like to have ALL the blocks pieced by Monday. In fact, I'd like to have the entire top (sans border) put together by Monday. Don't hold me to it! I may have to do some more 'thinking'. . . . I also played with my embroidery digitizing program over the weekend. Hmmm. . . will take a little time to get the 'logic' of it. I do now have a cross-stitch pattern of my logo (that you see above). Pretty cool! The house is vaccumed thanks to the 'vac-elf' and other misc. cleaning not-so-magically got done. I do LOVE those cannisters of Clorox wipes and Windex wipes - don't you? Wipe-wipe and toss. Clean! So. . . what is on the Monday-Map? Supper is going to be grilled pork loin, that's comfortably soaking in a spicy orange marinade right now in the refrigerator (thanks Hubster! ), asparagus, and some re-fried rice (fried rice leftover from last week). Tasty! Cinnamon-banana muffins would be awesome. Think the 'muffin-elf' and I will use up those last bruised-bananas for that one. We like to use the mini-muffin pan so you can just pop the little guys in your mouth with less temptation to 'butter 'em up.' Watching those calories! I want to finish cutting out all of my pieces, piece another block, then doing a bit of attaching. I also have more treasures to list on Etsy. Keep a watch in my ksyardbird store as there will be more things added on a regular basis. I have more ideas just oozing out of my imagination. . . my Inspiration Notebook is getting a workout! Of course there's W-O-R-K and laundry. . . really going to have to stop mentioning that stuff. It's depressing. And I'm sure I'll find something in this house that needs to be cleaned. ACK! Don't even like thinking about stuff like that.